You'll recognize the setting of the video: behind Cartel Coffee Lab in Tempe, in front of that abandoned laundromat across from Otto's on Ash Avenue and at the TourKidd launch show that took place at The Icehouse last month. Below is a lightly edited email interview I did with the group. Injury Reserve is a rap group that makes rap music. How would you describe your style? Also, who are your inspirations? We used to sound like a '90s boom bap knock off, but then we grew up and started making music that sounds like ourselves. Our biggest inspiration/competition is Kanye and Outkast. What's your origin story? What brought you together? Nate knew one of Parker's best friends (Jordan Howard). They were in line to buy some Jordan's. Nate was starting to rap and Parker was starting to make beats, so Jordan showed Nate some of his beats and we started making music together. Groggs came in to record some stuff and eventually everything consolidated into Injury Reserve. Our first EP as the full incarnation of the group came out last summer. The first song off that ("Black Sheep") came out the February before that. That's basically the start. Who do you work with most for production/promotion stuff — it's Las Fuegas, right? How did that relationship begin? The production is all Parker, because he's a producer and one-third of the group, so yeah. In terms of Las Fuegas, that all started with Nick (Herbert) bringing us into the local scene and managing us as part of this collective he started. Las Fuegas is very cool cause we're a bunch of ambitious, cocky, talented people working toward big big things. What has your career looked like up until this point? I know you've released "Whatever Dude"—I saw that at MonOrchid. What else? Our old EP came with a couple of videos. We started playing shows out here to build a name. We released "Whatever Dude" in February. We got some cool feedback from cool people on that. We opened for Action Bronson. Then we went to South by Southwest and played some shows and met more cool people. Now we just put out this video. 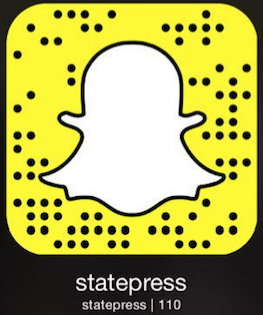 Read more State Press coverage of South by Southwest here. What was making that video like? How did Snapchat make it into that one? It started with the idea of telling a video through Snapchat, which then turned into figuring out how to make that look good. Although the outcome was supposed to look like a handheld iPhone, most of the video was shot on a $5,000 camera that we then superimposed the Snapchat interface onto. In some ways this was more of a challenge but in a lot of ways it was also less. Did you carry anything from that video to the one released today? We think people will see pretty quickly when they watch this new video that it's a complete departure from the previous one. While I think both are important statements about current youth culture, this one definitely comes off a lot more serious. Where "Whatever Dude" was designed to look personal and handheld, this one is a lot more observant and cinematic. What was your inspiration for specifically this new video & song? The main inspiration for this song was mediocrity. It calls people out for settling. Whether it be making lame music or choosing a lucrative major that you don't care about, the song serves to question people for not pursuing what they are really here to do. The video serves the song by portraying all of us as members of this passive state through its (at some points painstakingly boring) use of single slow motions shots. The end of the video breaks that notion up by symbolically using others to represent sameness and Nate as somewhat of a "defector." Hopefully, we make people feel uncomfortable about being too comfortable. What should we expect in the future from y'all? An upcoming album, more singles? We'll have two or three more songs coming before we drop our debut full length album, "Live From The Dentist Office." All these singles will be included on that project, of course.